It's amazing what happens when you slow your life down just a bit. I am making time for things I love again and while I'm trying to take a bit of a business break, I can feel a pull inside of myself to those things that I can't live without. Design being one of them (as you can see above I just can't stay away) writing being another, and last but definitely not least fashion. It has been such a mental challenge for me to try to say no to the paid work so I can just be and create without any pressure. It is so easy for me to convince myself that I don't deserve a break because my business isn't where I would like it to be but I hit some major milestones as of recently so it was time. There is never going to be a time where I will feel content with where my business is at because that's just not who I am. I am that workaholic type. I find my self-worth in work and right now I am trying to find it elsewhere. Tonight I found my self-worth at my other job contributing to something that I'm really good at and helping someone else's business. Isn't that great?! I also found it in a caramelized pineapple burrito that took me an hour to make from scratch...yes, I found my self-worth in a burrito. That is the truest statement I've ever written. I've been thinking about the why a lot lately. Why is design so important to me? Why can't I live without art? Why were these creative talents given to me. This is one of answers that I think will always remain the same. A gift is nothing if it is not shared. One of my greatest fears is that I will get to the end of my life and I will not have done enough to fill this world up with my creativity. It is meant to be shared and it is meant to connect, and it is not meant to be wasted. Not even one ounce of it. So far, all I have felt is gratitude. Maybe that mindset comes because I'm headed to Maine on Monday with my guy and we have two weddings this weekend. Maybe I feel gratitude because I make a constant effort to feel it. Maybe I am in this place because I've worked so hard to get my mind to this healthy place. Maybe good things come to those that hustle and better things come to those that rest. By taking a break, I am making time for the things that I actually work for. Not sure if that makes sense but as an entrepreneur I typically only have time for work and then the day is over. But part of the reason we work is to enjoy our lives. So we can have the things we enjoy most in life, right? Well, I wasn't doing that because I couldn't fit it in anywhere. So this morning I grabbed coffee with a good friend and caught up on her life and went shopping at one of my favorite local spots. In the middle of the week last week, I picked up and went to my family's farm for three days. It was amazing. Like this amazing. With all of this said, what I've learned from this short semi break so far is that I am doing exactly what I should be doing and love to do. And that right there is the best gift that my 22-year-old self gave to my 25-year-old self. So dive in, but take a break. It sounds so much simpler than it is. P.S. I launched a pretty sweet collection and you can shop the new cards here. Ya know because that's what normal people do when they take a break...launch a new collection. Here is a preview for you of the new "Birthday Wishes" card. There are six cards in the collection and each one is for a different occasion including "Congratulations", "Thanks", "Happy Birthday", "Thinking of You", and "Thank You." 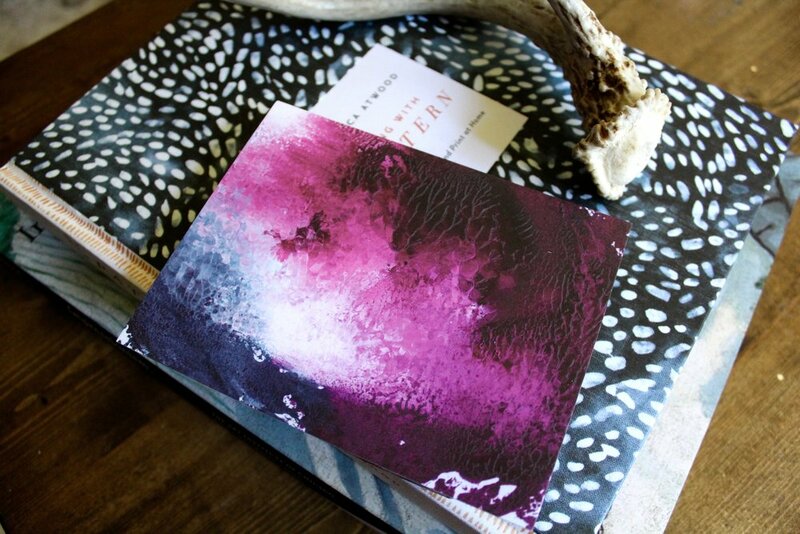 Each card features my latest abstract work on the front and they are double thick flat cards so the recipient can frame the card as an art print.